Snow city has been this year constructed back on the Tuvan Volunteers street. After experiments with the main New year tree erected at the park entrance, then on the Arat square, the decision is made to have it back on the old place. Rumours have it that the real reason for the new placement of the Snow City is the following - 12 snow animals standing on the Arat square with their 'backs' to the members of the Government (its building is on the Arat Square as well) arose constant disapprovement from the power-holders. Kyzyl resident Denis Smygalin has undergone in Novosibirsk a unique operation throughout which a rubber bullet has been removed from his head. It was delicately done through the nasal hole by surgeon Mihail Melnikov. Denis was brought to Novosibirsk after a direct shot has beaten his eye out and got stuck deep in the head. French traveller Nicolas Vanier, who is attempting to cross Siberia in a dog- driven sledge has reached Russia's Krasnoyarsk territory. The regional centre of the Russian Emergency Situations Ministry told Itar-Tass on Monday that on Sunday the team of the international project Siberian Odyssey left Tuva republic and set up a camp near the Yermakovskoye settlement. Nicolas Vanier told journalists that he had spent two days in Kyzyl in order to give a thorough rest to dogs. He intends to move on to Khakassia. New illustrated Tuvan 'Uraanhay' weekly is ready to publish free New Year greetings to Tuva and Tuvans. 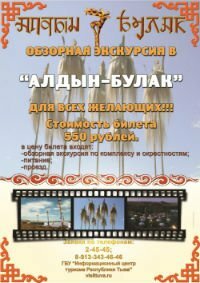 The new edition claims to make a bridge connecting Tuva-lovers and fans all over the world with the Tuvans in Tuva as the weekly will be distributed not only in the Tuvan capital (as the majority of Tuvan news-papers are) but in the countryside Tuva as well. One of the Tuvan Theatre Stars Nadezhda Naxyl has celebrated by a bright picturesque show full of humour the 25th anniverasary of her actor's work. She, inspite of her numerous colleagues in the Tuvan Drama theatre, has not passed a theatrical course at a studio in Moscow or Saint-Petersburg - with just a Kyzyl Art school in her background she, as many critics note, managed to preserve her natural charm. She can be very different - a beautiful young lady and an ugly old woman, tragic and comic. 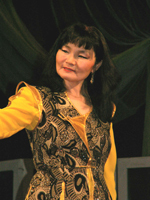 She is one of the best presenters of Tuvan poetry. Heating service has resumed in Kyzyl, the capital of the Russian republic of Tuva, after partial repairs to the city's heating system following an accident on Sunday that left 110,000 homes without heat, the Russian Emergency Situations Ministry said. Kyzyl with the population of 110,000 does not have centralized heating supplies because of an accident at the local heating plant, a source in the Russian Emergency Situations Ministry press service told Itar-Tass on Sunday. A cable that supplies electricity to pumps had a short circuit, “and a pipe that supplies water to three boilers had a hydraulic shock and a rupture,” the source said. 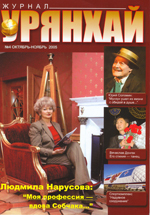 The 4th issue of the new illustrated Uraankhai magazine has been recently released. Tuvan contemporaneity images and rare photos of the Tuva in the early 20th century are published there. It gives a review of the latest Tuvan events and speaks of the present hot Tuvan topics - construction of the railway, whether it is a good or an evil for the republic. Tuvan senator Ludmila Narusova thinks it to be the way out of the present poor economic situation in Tuva. Yuri Solomin, great Russian actor, Maxim Munzuk's partner in the 'Dersou Uzala' film sticks to the contrary view - it will bring to the loss of the culture, its dissolution. Russian authorities are worried at the demographic situation in the country. The birthrate in spite of the undertaken measures is still on the decline. Vladimir Putin has decided to allocate additional finances - 50 million rouble - from the Presidential Reserve Fund to help the maternity homes in the far off regions to buy modern equipment and technologies. Kyzyl maternity will receive over 1 million rouble out of it.